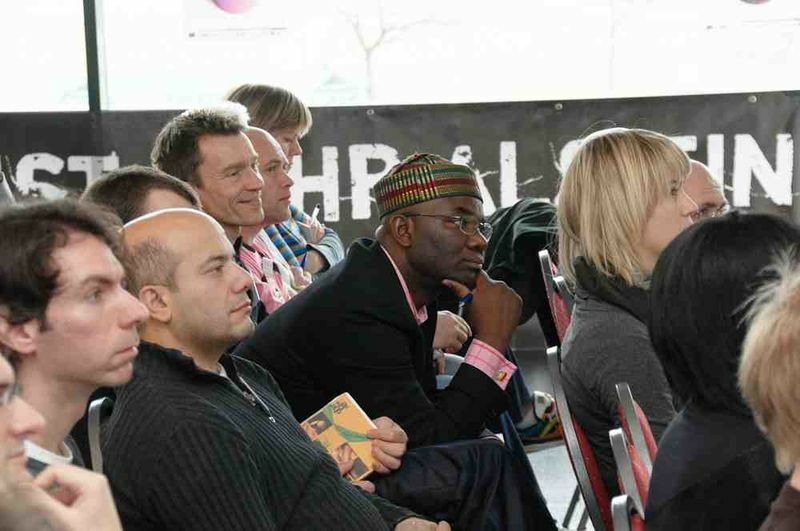 The Audience at the Networking Conference in Vienna: Starting the Project "Football for Equality"
December 2009 - At the Networking Conference a new project was initialized to raise awareness on racism and homophobia and to combat these forms of discrimination across Europe: "Football for Equality". "In a stadium full of people you hear dumb or abusive remarks. (...) We as players talk about these incidents and we also talk to our fans so it won't happen again. We are strictly against any kind of discrimination, as we are coming from different countries. The important thing is that we play football together", said Steffen Hofmann, the captain of the football club Rapid Vienna, when he visited the Vienna Networking Conference in 2009. His remarks call attention to the problem of discrimination, which still exists in European football and shows the will to fight against these discriminations. The 100 participants of the Conference shared this points of view and exchanged their experiences of fighting against racism, homophobia and other related forms of discriminations, like islamophobia, anti-semitism or sexism. On this basis, the main objective of the conference was to start the project "Football for Equality: Challenging racism and homophobia across Europe" and therefore bring the fight to a new organisational level. The project had already started one month before and was mainly funded by the "Fundamental Rights and Citizenship Programme" of the European Commission. Fan groups, NGOs, Lesbian-Gay-Bisexuell- Trans-Groups (LGBT), ethnic minority organisations, representatives from football bodies and fundamental rights organisations from more than 20 European countries joined the conference, that was organised by the partners of the international network "Football against Racism in Europe" (FARE). One part was hold up in the Horr-Stadium of the Viennesse Football Club Austria, the other part in the Hanappi-Stadium of Rapid. The Networking Conference took place from December 12th to 14th and the line-up was a mix of workshops, plenary debates and evening events. The first plenary debate focused on the exchange of different approaches and the possibilities of an united movement in fighting against discrimination in football. Afterwards the different workshops took place. The subjects of the workshops ranged from far right tendencies in Eastern Europe with regard to the Euro 2012, to anti-racism education for the South African World Cup 2010 and the role of fans in this struggle. In the second debate, each workshop showcased its results for the whole conference to discuss. 10 Years of "Football against Racism in Europe", Start of "Football for Equality"
The last session was dedicated to FARE, because at that time the organization reached its tenth year of existence. So the conference took the anniversary as an occasion to review their work of the last years and to look ahead into their future persepectives as well. Using the popularity and universality of football as a unique entry point to raise awareness on racism and related forms of discrimination (xenophobia, islamophobia, anti-Roma racism and anti-semitism) and on homophobia. To adress and link areas of combating racism, xenophobia and anti-Semitism on the one hand and the fight against homophobia on the other hand. To promote and improve intercultural understanding in particular among young people in the European Union. Ulrike Lunaczek, co-president of the LGBT Inter-Group of the European Parlament was satisfied about the fact that homophobia was adressed at a FARE event so prominently. The conference made an issue of this invisible form of social discrimination. Here, it became clear, that ignorance and resistance still exist among football representatives and that a lot needs to be done to really combat discrimination beyond symbolic support for inititiatives. The Austrian media gave recognizable attention to the Networking Conference: Television and website atricles reported about it, especially about the evening celebration of the 10 year anniversary of FARE. Prominent Austrian and international football players like the already mentioned Steffen Hofmann or the Montenegrin Branko Boskovic and football representatives like the Chairman of the Austrian Players Union Oliver Prudlo were in attendance. "I Will Always Support FARE"
Also Samuel Koejoe, the Surinam ex-player of German and Austrian top leagues, visited the conference. For him the Networking Conference and building of "Football for Equality" was a step toward a more tolerant world of football: "The situation in football is getting a little better, because of people like you who are fighting actively against racism, and therefore I will always support FARE."